What Does Nearly Every Us Weekly Story About Rob Kardashian Have In Common? Beginning in 2014, two years after this particular descriptor (I don’t want to reveal it just yet) could first be applied to him, Us Weekly began referring to Kardashian in this very specific way in nearly every story that features him prominently. Now, if other publications used the descriptor as frequently, it wouldn’t be an issue. This post wouldn’t exist! But while this title makes infrequent appearances in publications like TMZ, E! News, and People, Us Weekly uses it every single chance they get. There are several potential explanations for this. 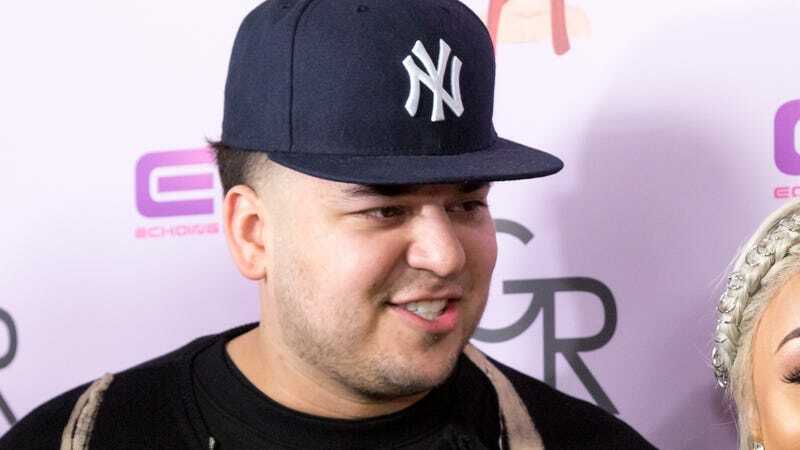 One is that using descriptors more frequently than pronouns could be part of Us Weekly’s style guide, and that Rob Kardashian simply doesn’t have as many professional credits to his name for them to provide readers with much variety. Another explanation could be that they have a close relationship with the Kardashians and do whatever they can to make them happy, i.e. subtly promoting one of their many brands. But a final explanation—the one I’m inclined to believe based on absolutely nothing—is that they just think it’s funny. Because, let me tell you, it is. See for yourself. The Arthur George sock designer, according to his big sister Khloe Kardashian, has been overseeing construction on her new Calabasas, Calif., home as she films her reality spinoff this summer with sister Kourtney and family in the Hamptons. “lil Miss West in the building lol,” the Arthur George sock designer, 27, captioned. Unlike his big sisters—who chided Bailon via Twitter for kicking Rob “when he’s down”—the Arthur George sock designer wrote nothing else regarding the subject matter. But since he began dating Blac Chyna in January, the Arthur George sock designer, 29, has slimmed down and reconnected with family. “I’m going to get this. Go dodgers,” the Arthur George sock designer captioned a throwback Instagram photo of himself last week in a similar outfit from years ago. While unintentionally becoming part of the Kardashian fame machine wasn’t easy for the Arthur George sock designer, Disick explained that his quasi brother-in-law is doing much better these days. “It’s fairly new,” a source tells Us of the Arthur George sock designer, 30, and reality star, 26. The Arthur George sock designer also repeated his claims that he dropped $100,000 on plastic surgery for her after she gave birth to their 7-month-old daughter, Dream. “Hahahaha Chyna just sent me this video saying happy 4th of July what a crazy person,” the Arthur George sock designer captioned a video of the reality star kissing an unidentified man. While his family — including mom Kris Jenner and sisters Kim, Kourtney and Khloé Kardashian — are disappointed in Rob, the source notes that Chyna and the Arthur George sock designer, who dated on and off since their April 2016 engagement, are no strangers to drama. “I’m gonna start training him myself,” Chyna was heard saying in an April 6 Snapchat video showing the Arthur George sock designer stepping onto a scale. The Arthur George sock designer could be heard laughing in the background. The Arthur George sock designer, 29, and former music video model, 27, have been nearly inseparable since first stepping out together. “Dream Team,” the Arthur George sock designer captioned the clip via Instagram. In the pic, the Arthur George sock designer, 29, is resting in bed with the adorable 3-month-old. “I can’t wait to hear what my baby’s voice sounds like,” tweeted the Arthur George sock designer, 30, who shares his little girl with Blac Chyna. The Arthur George sock designer, 30, and the model, 28, shared a series of adorable photos of Dream, 4 months, on their Snapchat accounts. “Thank you KimYe 🙌🙌🙌🙌 baby yeezys mooooovvvvvieeeee @kimkardashian,” the Arthur George sock designer captioned the image, of two pairs of Yeezys displayed on their boxes, surrounded by giant pink balloons. As previously reported by Us, Chyna, 27, confirmed on Tuesday, April 5, that she and the Arthur George sock designer, 29, are engaged. While Chyna, 28, five months pregnant with their daughter, has filmed solo during his recent absences, the Arthur George sock designer fears the spinoff was a mistake. “I love this man @robkardashian,” she captioned a collage of PDA-filled photos with the Arthur George sock designer, 29, on Instagram Tuesday, December 13. The news came two months after Chyna and the Arthur George sock designer announced they were having a baby. Earlier this month, the Arthur George sock designer revealed in a series of emotional Snapchats that Chyna left him and took Dream. The Arthur George sock designer and Chyna, 29, called off their engagement in February and are parents of 7-month-old daughter Dream. The Arthur George sock designer Snapchatted an empty nursery and said that Chyna took the pair’s now 5-month-old daughter, Dream, and moved out right before Christmas. The surprising snap comes just hours after the pair showed off the amazing purple Lamborghini that the Arthur George sock designer bought for his lady love. The Arthur George sock designer’s family is disappointed in his actions, too. The Arthur George brand, the name a combination of Robert’s middle name - Arthur - also his grandfather’s name, and his father’s middle name - George - was born from Robert’s life-long passion for men’s accessories.